Mantis is a family run collection of award winning, privately owned, five star properties located around the World. Divided into five distinct groups, its specialist areas include Boutique Hotels, Game Reserves, Eco Lodges, Ski Lodges and Chalets and Yachts, which includes Zambezi Queen. Decorated in tasteful neutrals with African artwork, zebra rugs and faux leopard skin cushions; service is exceptional, the food is superb and there is an open bar. 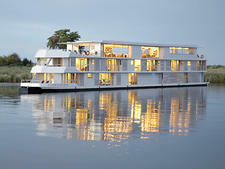 Zambezi Queen is owned and operated by The Mantis Group, which has hotels and eco-lodges worldwide. The boat is also featured by luxury river cruise line AmaWaterways, which sells four nights onboard as part of extended Africa packages. The vessel itself is stunning, all done up in tasteful neutrals with African artwork, zebra rugs and faux (of course)-leopardskin cushions. Service is exceptional, the food is superb and there is an open bar serving quality South African wines. The Mantis Collection operates Cruceros Australis, a two ship line which operates in one of the most beautiful wilderness regions in the world: Patagonia and Tierra del Fuego, at the southernmost tip of South America. The fleet comprises two cruise ships: the 136-passenger Via Australis and the 210-passenger Stella Australis. From September to April each year, these vessels sail every week from Punta Arenas (Chile) and Ushuaia (Argentina), navigating the Strait of Magellan and the Beagle Channel down to Cape Horn. Mantis also owns and operates a number of luxury yachts in various destinations including the 100-passenger M/V Pikai and the 48-passenger Yacht La Pinta, which both sail in the Galapagos Islands.